Long time no blog. I've been manically busy on lots of lovely interiors projects so thought I'd show you a little about some recent projects that have been keeping me so. First up, I'm super proud of this bathroom makeover for a client in Regent's Park. It within a beautiful Edwardian house, at which I've been lucky enough to design some of the rooms. In the master en-suite bathroom, my favourite design aspect is that I used zero tiles - not one single one. I wanted it to feel like a grand room in it's own right, and avoiding tiles, a typical bathroom essential, is a key part of the design to create this look. We used glass for the shower interior and splash back, colour matching it to the wall paint. The previous owner had gone a bit "spanish hacinda" on the bathroom. My client wanted to replace this with a luxury spa-like place to bathe. It was also important to be sympathetic to the original features of the house. We stain matched new floorboards to the originals in the bedroom. The additional of a wall of foxed vintage mirror by Rough Old Glass added some glamour, with low level lighting around the very beautiful bath from V+A baths. I'm so pleased with this project, and it seems the Houzz audience agree with me. This bathroom has been pinned to over 20,000 idea books, meaning it's in the top 10 most popular bathrooms in the UK out of thousands on Houzz! Let me know what you think! All these lovely pictures where taken by the lovely Carole Poirot. And most of the accessories used to style the shoot are from West Elm. Carry on scrolling down to see the "before" pictures too - for full transformation ta-da-ness! Hello my lovely stylish friends. Are you feeling the Christmas vibe yet?! I know it may sound cheesy but I goddamn love Christmas. Festive styling fills me with absolute joy every year - no matter now many trees I decorate. I'm particularly excited this year, as I have several big Christmas styling jobs, which means I get to style Christmas in more ways than one - yay! The project I'm installing this week is going to be truely EPIC. Literally - that is my brief. That's the best brief ever, right?! MoneySuperMarket, well known for their kooky EPIC adverts, are putting on a rather exclusive VIP event. Its going to be in an extremely cool loft style apartment in Shoreditch, with food, cocktails, DJs, and other awesome entertainment. This is a super fast turn around project, with less than 2 weeks to prep! Sometimes that the best way to do things though I think. I can't say much more about it at this stage, as its super exclusive, but I can tell you I have some pretty awesome props on the way.. So - thinking like this is sounding pretty cool? Wishing you could come & join in the fun? Well - ta da! Your wish could be granted! If you want to be one of the lucky VIPs, plus see what I EPIC styling I come up with, you can win tickets here. Honestly, its worth a shot. There may be polar bears involved - that's all I'm saying. One thing's for sure - its gonna be EPIC! I'll report back after the event! There really is no better way to give a room an instant spruce up, than adding some new cushions. It's like a new hair do. A little extra glamour without making your credit card cry. I've had a long term cushion crush on the work of Bianca Hall. In fact, I was so in love with one of her past collections, that I used it in 3 different client projects. Given that I normally don't like to "cushion repeat", this is quite some affirmation to the fact that Bianca does "good cushion". 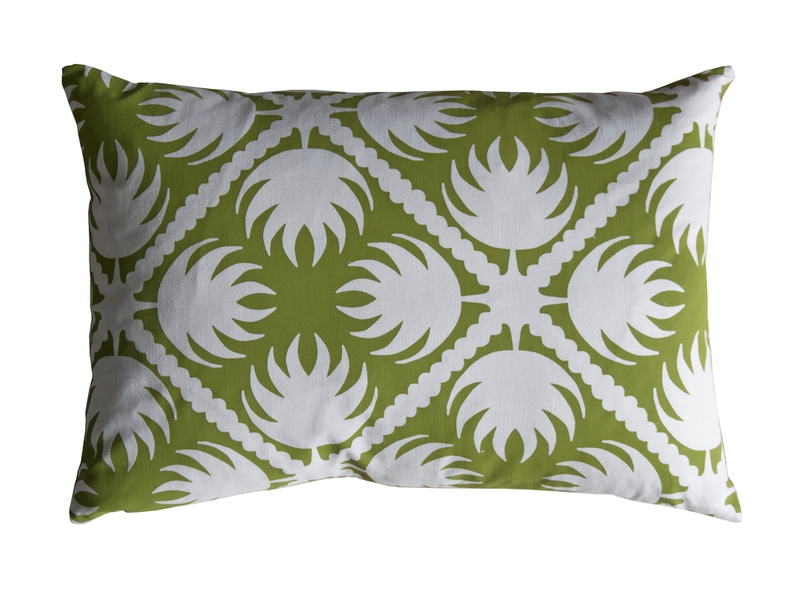 Luckily for me, you, and my clients, Bianca has just created a new and pretty fabulous range of cushions, called the Tropica Collection. Here's a selection of my favourites. If you read Bianca's blog, French for Pineapple, you'll pick up that B has a bit of a penchant for pineapples. You can see the influence of this on-trend fruit in the collection. With patterns first worked in paper cuts before going digital, and much trimming research, the detailed work that's led to this range is obvious in the perfectly finished designs. These cushions (and there are napkins too) are exclusively available on Bianca's website. Prices start at £42.00 for a cushion, or £37.00 for a cover only. They're lovely on their own or try putting 2 or 3 different colours together. I know B would be happy to advise on a good combo. And just because I love you, the lucky FIRST 15 READERS to make a purchase will receive not only 15% DISCOUNT, but also a FREE notebook. Just add code MIS15 at the checkout. Racing you to the "buy me" button. I recently styled a product shoot for Ali Miller, a very clever designer whose creations take inspiration from her own nostalgic memories as well as life experiences. Her tea cups and saucers are used in the uber cool restaurant, Sketch London, hence we were lucky enough to be able to do our shoot in some of the crazy room sets there. I created several different seasonal set ups for Ali's ranges, but my favourite has to be the ice cream shots. I am so pleased this idea worked well, as it was a bit of a risk in the heat of a restaurant on a sunny day. We had very limited time and our extremely patient photographer, Yeshen, waited until just the right about of "melting" had taken place. Me arranging tea cups and ice cream. Didn't use those flakes on the side. Sadly I had to eat them instead. Being allowed to do things like this is the reason why I love my job so much! Here's some more behind the scenes shots from the day. You may also spot a life size Tiger, just from my prop cupboard..
You can buy Ali's pieces from her website, although these coloured ones are not available as yet. A teacup and saucer is a very reasonable £32. No design show would be complete without my line up of pink finds would it?! :) This year my London Design Festival visits were time challenged, but I still managed to search out plenty of pink goodies. 9. Pink Feet on black velvet chair - Out of the Dark. Did I miss anything? Let me know if you found any more pink loveliness at London Design Festival! Wow. What a whirlwind month September has been. Prepping, making, building, styling, curating, discovering, chatting, hosting, followed by de-rigging, packing and finally the obligatary post LDF illness. Putting on my own LDF show together with Out of the Dark was mega exciting but I now have a lot of catching up to do. I can't believe I haven't even had a change to blog about the beautiful creations from the show. So let me start by introducing you to Daphne. Daphne is a beautiful vintage french bed. She is upholstered in perhaps my favourite colour for velvet - a luscious deep green teal. It reminds me of a peacock. The woodwork is painted in a light blue/grey. 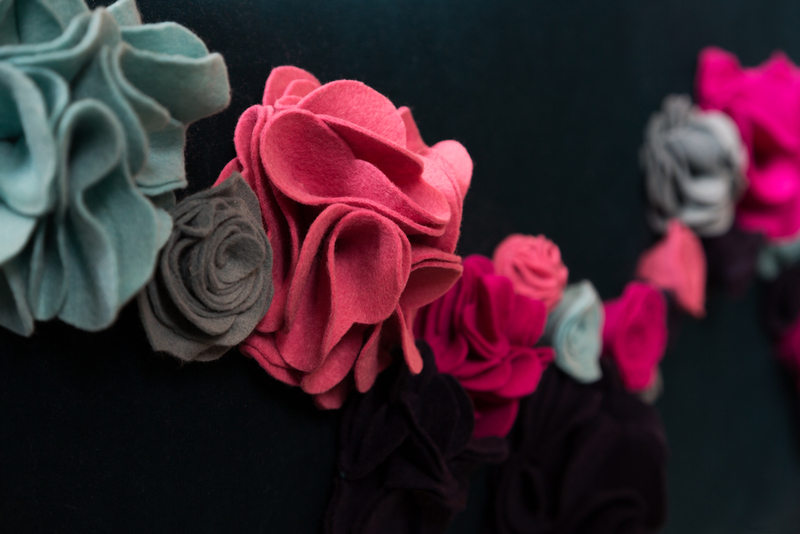 The 3-D handmade felt flowers in green/grey, navy and dusty pink, wind their way across the footboard, popping up briefly on the headboard. Enough to be pretty yet high enough so as not to interfere with everyday use. I can't tell you how long I spent putting my colour combos together. It's something I love doing for clients, but for myself, for a furniture exhibition, its a whole different ballgame. I'm really happy with the results. Here's some photos by the lovely Paul Craig - let me know what you think about Daphne. Daphne is a one off and available for sale for £1,350. I've just taken a commission for a version of Daphne in clients own colour ways - can't wait to see what we come up with! Meet more of the family next week! All bedding is from Next with thanks. Continuing with news from my latest project (read Part 1 here), I thought I'd let you into a couple of little artwork secrets. Choosing art for a hotel or rental apartment is a tough gig. It needs to be something interesting to a wide range of visitors. To be impressive and yet not stand out to the point that some may not approve. And of course it needs to complement the design scheme. And the location. And be the right size. Plus, the art budget is never as big as you want it to be. Not easy! I have discovered a company that's fab for covering all of the above, and appropriately called - Easyart. I used EasyArt for a large chunk of the artwork on the project. They carry 1,000's of prints, with great search options either via artist, style or subject. From there you choose the size, framing or canvas etc. The buildings are modern, state of the art apartments, but surrounded by beautiful nature, so I chose to complement both with a few pieces by Marion McConaghie, as I LOVE her prints. In the contemporary penthouses I found some great abstract pieces to complement the interiors. To stretch the art budget just a little further, I wanted to include some bespoke abstract art (with the aid of my glamourous assistants Polly Ord & Eleanor Andrews). I recently had a go at "ombre art" at "Meet the Blogger London" led by Dulux Creative Director, Marianne Shillngford, and I thought this would be a great way to add more colour to the walls - simple yet impressive and in the colours I needed. I'm really pleased with the results! Finally the very talented Polly also painted some little pictures for the entrance door to each apartment, all named after local wildlife. All the aparments are named after local birds. Hand painted artwork created for each property. Art is an important part of design and life generally, and accessible whatever your budget. Why not have a go at your own ombre art & let me know how it goes! If you follow me on instagram, you may have noticed that I was lucky enough to spend last week skiing in Kitzbuhel, Austria. With my eyes ever on design, I went through several ups and downs on slope side decor. One the one hand, its so perfectly traditional to walk into a restaurant with animal skins on the walls, pine panelling and red gingham curtains. Then I thought, come on, it's 2013, can't we get a bit of scandi-chic going on here? However by the end of the week, I'd fallen back in love with the relaxed mountain library and ornate furniture. It seems it's stayed like this for a reason. Its all part of the experience. Take a look at my holiday snaps and tell me what you think - do you love the traditional look or is it time to get with the programme? I stayed at Villa Mellon, Kitzbuhel, Austria.